A client required a solution to raise European step frame trailers to a suitable height to allow them to be (un)loaded using their existing dock levellers. A pair of bespoke steel risers were supplied and installed to raise the rear of the trailers level with the loading bay. Due to the incline of the loading bay this also meant that the trailers were more level creating a safety loading operation and reducing rain ingress. Packers were used to allow for the variations in the concrete. 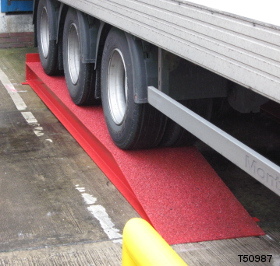 Our standard wheel alignment curbs were used to ensure the trailers were driven centrally on the risers.